Even though I'm covering 20 stores in this group, only three of them are chain stores. Food Bazaar is the first we're going to see. 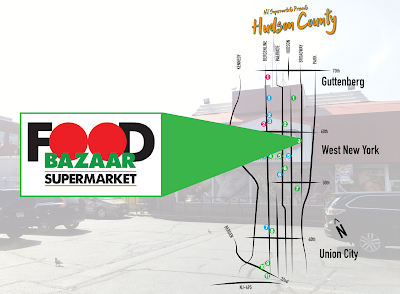 We've already seen Food Bazaars in Fairview, North Bergen, Elizabeth, Mount Vernon, and Bridgeport, along with the Farmers Market of Bridgeport. The WNY location is the oldest I've been to, and aside from the Farmers Market, also the smallest. This particular location opened in the 1960s as a Finast (FIrst NAtional STores), which was taken over by A&P by the 1980s. 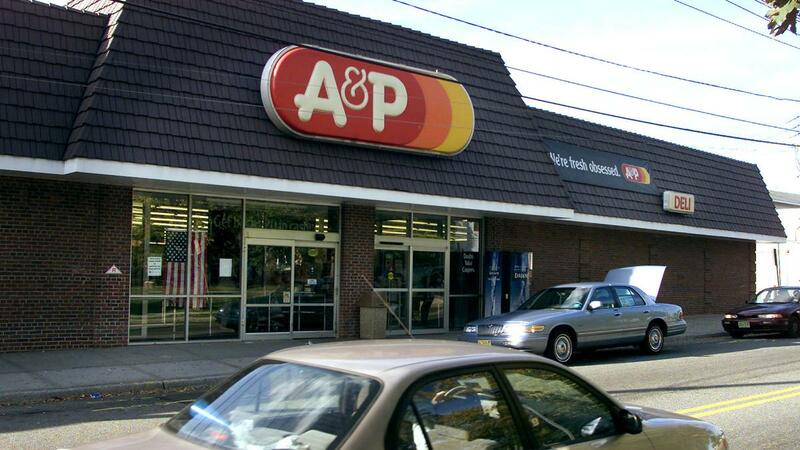 A&P then moved to its newer location at 55 Riverwalk Pl around 2002, and Food Bazaar was open by about 2005. This was Food Bazaar's first store in New Jersey. As a side note, the Elizabeth Food Bazaar's store manager Kevin Kim was previously an assistant manager at this location. Not much doubt as to what the store used to be! 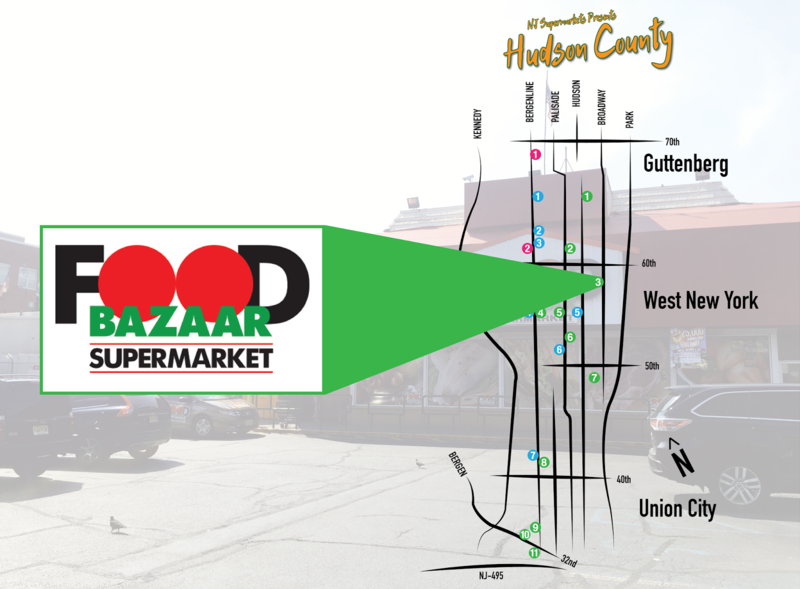 The A&P shape actually works very well with the new Food Bazaar logo. At first glance, the facade does not appear to be very A&P-like. However, look behind the red awning and you'll see that the facade is identical to that of the old South Orange location and countless others of the time. The store has been expanded to the right. There would have originally been an entrance and exit on either side of the protruding center part with the windows, but Food Bazaar only uses the one on the right side. You enter under the yellow delivery sign. Strangely similar to Universal in Rahway, you make a 180-degree turn to the right to walk straight into a separate room that houses produce, meat, and floral. A narrow entranceway, unfortunately. Not a great first impression. You walk along the front wall (by making a 90-degree turn to the right here) along the "wall of values" into produce. The produce department is significantly nicer than the entranceway. The floor has recently been scraped up to be just concrete (maybe minimally polished), which is a look I really like. Food Bazaar has updated the wooden produce cases and replaced the lighting but the decor remains from before. The "special deals" sign is from Food Bazaar's latest decor. Here you can see the wall decor which consists of oversized murals of food. Although they look hand-painted, the same decor appears in many Food Bazaars, so it was probably hand-painted once and then digitally reprinted for multiple stores. As usual, this Food Bazaar's produce was the best around. More limited organic selection than other Food Bazaars, but more than when I visited the same store the year before. Heading back towards the meat department from produce, we pass a small floral section. 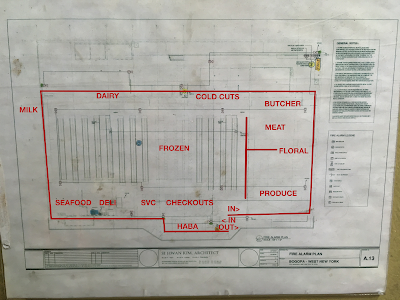 The service meat counter lines the back wall with packaged meats in the space in front of it. The produce department lines the cases to the left here. Food Bazaar continues to use a similar layout in their newer stores, except seafood tends to be between produce and meat. Large butcher with newly-replaced cases. The tile along the back wall forms the NYC skyline and the word "welcome", and is a unique feature installed by Food Bazaar. Seafood also has mosaic tiles. 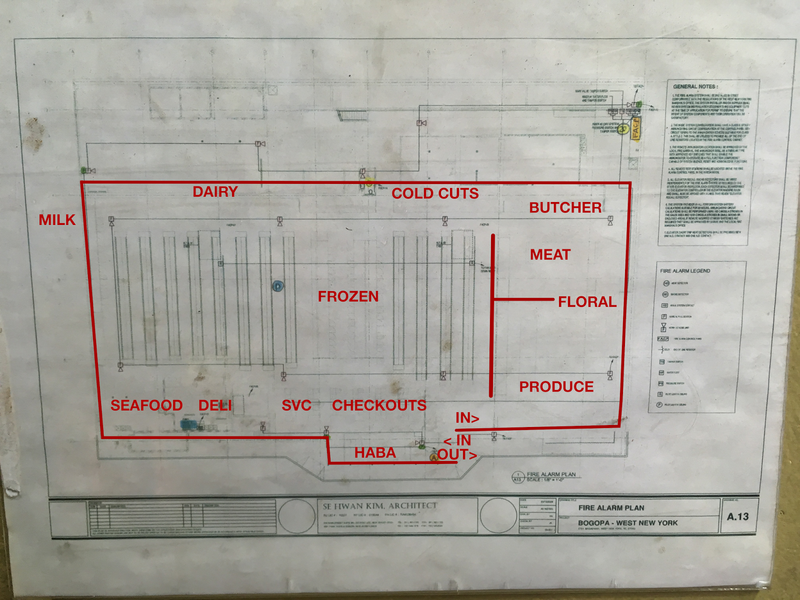 Cold cuts and dairy continue along the back wall from the meat/produce area. 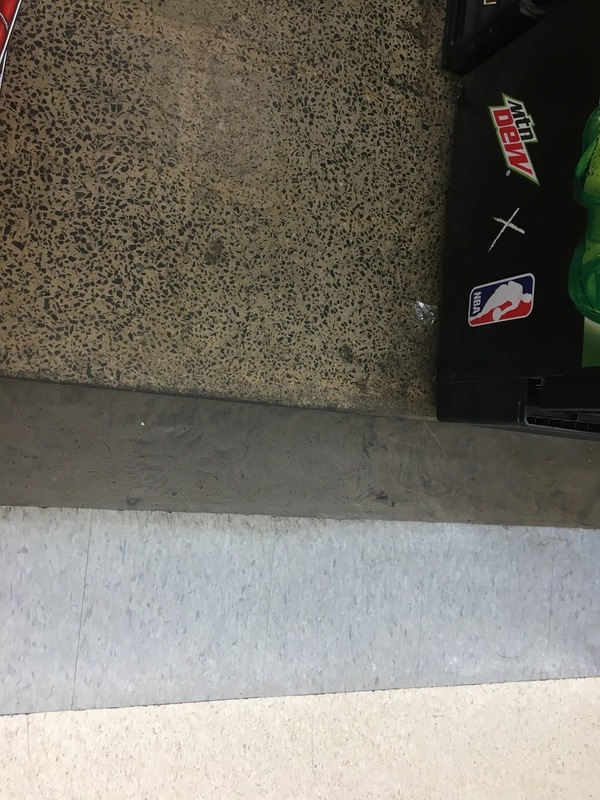 Notice how the grocery aisles have old laminate tile, which probably won't be replaced (unfortunately). Looking down the back aisle with a huge selection of quesos and cremas. This store probably has extremely limited backroom space, which has caused them to stack boxes of stock on top of the dairy cases (which isn't the case in Food Bazaar's larger stores). A look down the international aisle, or should I say, one of them. As with most ethnic stores now (but a tradition started by Mi Bandera in Union City...coming soon to this blog!) the groceries are separated by country of origin rather than type. Old shelving on the left and newer shelving with the posts in front on the right. Most of this store's shelving has been replaced. Like with many stores of the 1970s, the freezer aisle is in the center of the store. These freezer cases are brand-new, installed some time between my spring 2016 and my summer 2017 visits. Here in the pet food -- and soda, and snacks -- aisle, with new shelving on the right again and old on the left. As usual, the seafood selection was very impressive. Unlike the newer stores in Elizabeth, North Bergen, and Fairview, the seafood here is actually self-serve. You choose the seafood you want and put it on a styrofoam tray, then an employee behind the counter wraps it for you. The tile along the back wall is an impressive mosaic, like the one behind the butcher counter, and was also installed by Food Bazaar. This area of the store is nearly impossible to photograph because it's the busiest section, and also the most cramped. A small selection of baked goods (brought in from elsewhere) and some cheese is in the case right next to deli. Customer service is just on the other side of this case, with the registers beyond that. A look down the front-end, which becomes slightly less cramped. 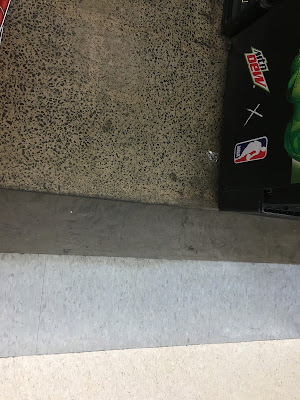 Also, notice that the flooring around the registers has been switched to concrete (like the grand aisle). By the way, these aisle markers have since been replaced. They can't scrape up the rest of this floor soon enough for me! A close-up of the multi-leveled floor: concrete, subfloor, old gray tiles, new(er) white tiles. They do this so it's not so much of a ridge between the two sections. 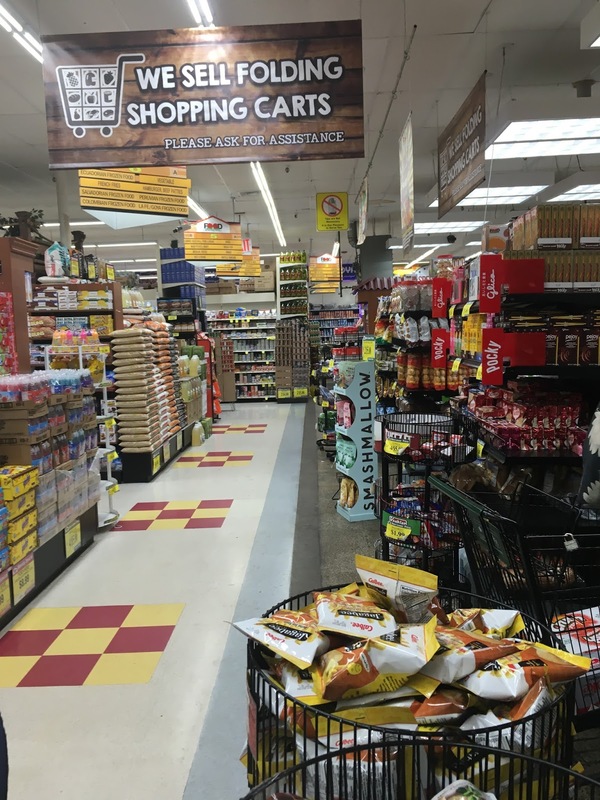 True to the Food Bazaar style, every inch of the store is used. Candy and office supplies (now there's an interesting combination) line the front wall, with some HABA to the left. Customer service is immediately to the right here, with the first register to the left. No, this sure ain't no Publix in Florida. One look along the front-end before heading out. The exit is at the far end here. And that's all, folks! While the WNY Food Bazaar is obviously not as impressive as the newer stores, it's still a very clean, well-stocked, and fairly modern full-service supermarket. Just don't bring your seven kids to do food shopping with you, or you'll fill the whole store! Like you said, this sure ain't no Publix in Florida (or elsewhere, for that matter)! Definitely a much different experience! Anyway, I really liked the tile murals they had here in the meat and seafood departments. I looked at them a bit closer and they're actually quite intricate with all of the tiny tile pieces. Mostly I was referring to the space around the customer service counter. Plus, you had just posted those photos when I was writing this post! You're right, they are very intricate. I wish I could have gotten a better picture of them, but Food Bazaar actually has a pretty strict no-photography policy, and both the butcher and the deli were very busy.